Algerian President Abdelaziz Bouteflika has been flown to hospital in Paris after suffering a mini-stroke, the state news agency has said. Mr Bouteflika, 76, had a "transient ischemia" - a temporary blockage of a blood vessel often called a mini-stroke - an official told the APS news agency. Doctors said on Sunday that he was "progressing well" and the damage was "not irreversible". Mr Bouteflika is being treated at the Val de Grace military hospital. It is commonly used by high-profile patients from France and beyond. Mr Bouteflika's doctor, Rachid Bougherbal, said: "The transient ischemic attack did not last long and the condition is reversible. His state of health is progressing well." 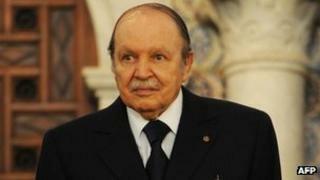 Dr Bougherbal said Mr Bouteflika had "complete balance" and was "recovering some of the fatigue caused by the ailment". Prime Minister Abdelmalek Sellal echoed Dr Bougherbal's assurances that there was no need for concern. Mr Bouteflika, who makes few public appearances, underwent surgery in hospital in Paris several years ago. Officially the problem was a stomach ulcer, but a leaked US diplomatic cable suggested he had cancer. In spite of his age and apparently failing health, there are still those who believe Mr Bouteflika could stand for a fourth term in office in elections scheduled for next year. He is part of an ageing leadership which has dominated Algerian politics since the country gained independence from France more than 50 years ago.